Two exciting technological changes will be coming to Yale-NUS. Firstly, in November this year, Yale-NUS College will sign a collaborative agreement with Surbana Jurong for use of our campus as a technological testbed. Secondly, the Infrastructure, Safety & Security Office (“Infra”) will conduct a pilot launch of their “Snap & Send” app, an app designed to supplant our current system of using email to report defects. In an interview with Yale-NUS President Tan Tai Yong, he said that negotiations are ongoing with Surbana Jurong for a collaborative arrangement. Surbana is an urban, industrial and infrastructure consulting firm wholly-owned by the Singapore Government. The arrangement will allow Surbana to use our campus as a technological testbed, and in return, Yale-NUS can pursue research opportunities with them. Two technologies Surbana will likely test in Yale-NUS are Predictive Lift Maintenance and Smart Lighting. Predictive Lift Maintenance involves the installation of sensors in the lift, with the information gathered used to predict breakdowns. Smart Lighting uses sensors to detect human presence and dim the lights if nobody is present. These two technologies and more are part of Surbana’s current “Smart City in a Box” project to develop technological infrastructure and associated apps for use across Singapore. The agreement will tentatively be signed in November 2017. In addition, there will be a pilot launch of Infra’s defect-reporting app: “Snap & Send”. Director of Infra Mr. Dennis Aw said that a “cocktail table” event to galvanize support for and kickstart the app’s pilot launch will be planned. The “Snap & Send” app allows students and staff to directly send information about defects, including pictures, to the specific officer-in-charge. There are nine categories: pests, door, aircon, power trip, lightning, plumbing, building, electrical application, others. Each user will have their own personal account for better communication with the officer-in-charge, and for a better record of case details. Mr. Aw states that the app is intended to supplant the current email system for reporting defects. These two initiatives add to the already extensive list of technologies employed in our campus, such as WOW Vision and Pexip. WOW Vision is a system introduced to Yale-NUS in 2013 which allows us to project the video and audio feed of our devices onto any screen on campus connected to the WiFi network, removing our reliance on conventional cables. Moreover, WOW Vision offers functions like file-sharing, screen sharing, and the ability to have maximum four devices project simultaneously in a split-screen format. Yale-NUS also has a video-conference system called Pexip available for use at the Elm, Saga, Cendana Conference Rooms. Pexip is often used by professors to conduct lessons without being physically present. Professor Marcia C. Inhorn used Pexip to conduct classes during the one-week hospital leave she was forced to take after breaking her foot in a fall. When asked about the performance of Pexip, Ms. Inhorn replied: “It worked extremely well, with no connectivity issues. A great way to still teach a class from afar!” One can also make a request at the Media & Classroom Technology department to use Pexip elsewhere in campus. Major initiatives like Infra’s “Snap & Send” app and the introduction of WOW Vision are the brainchild of respective department directors: Director of Infra, Mr. Aw, and previous Director of Educational Resources & Technology, Mr. Ken Panko. The administration has expressed its openness to ideas from the student population. “Students can come up with all sorts of ideas, [and if] it is a good idea, we will support it”, says Mr. Tan; though he proceeds to state that feasibility of project and level of commitment remain as barriers to student-led technological initiatives. The technological advancements in Yale-NUS parallel the proliferation of technology in NUS and across Singapore. Recently, an initiative called “Virtual NUS”, or “NUS Living Lab”, was introduced to transform Kent Ridge Campus (which includes University Town) into a living laboratory for the development and testing of big data technologies. Sensors will be planted campus-wide to monitor traffic, and devices connected to the NUS WiFi network will be traced to monitor crowding. Uses of the data include predictive deployment of NUS internal shuttle buses, and the development of crowd-monitoring apps like the “NUS Foodie” app which provides real-time estimations of canteen crowd sizes. This initiative is part of Singapore’s nation-wide push to integrate technology into the lives of the people and become a “Smart Nation”. 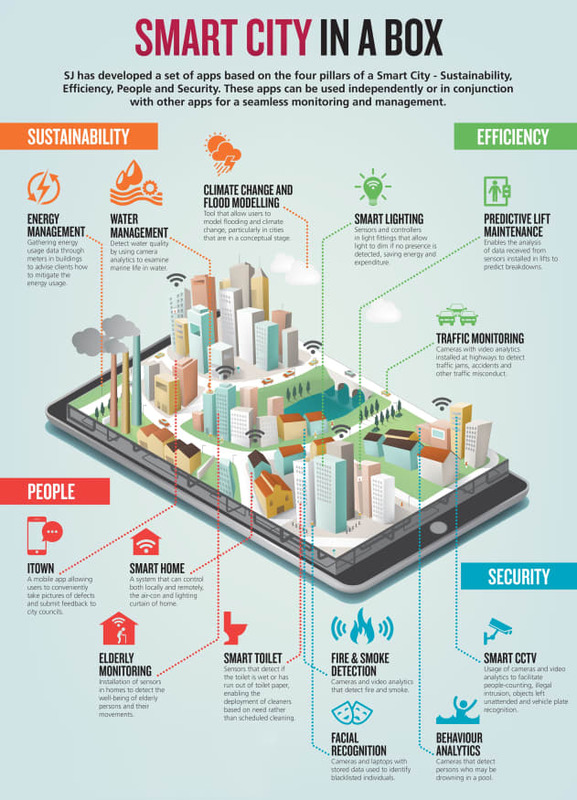 One of Surbana’s major contributions to Smart Nation Singapore was to develop a set of apps which are collectively known as “Smart City in a Box”. Those who wish to know more about Pexip or WOW Vision may consult the Media & Classroom Technology department, or the library staff. There is also a guide for the use of Pexip in the three College Conference Rooms: https://arts.yale-nus.edu.sg/pexip/#.